Your design should be optimised to print three tickets per A4 sheet, in is also possible to print them double sided which is especially useful when representing paper money currency. 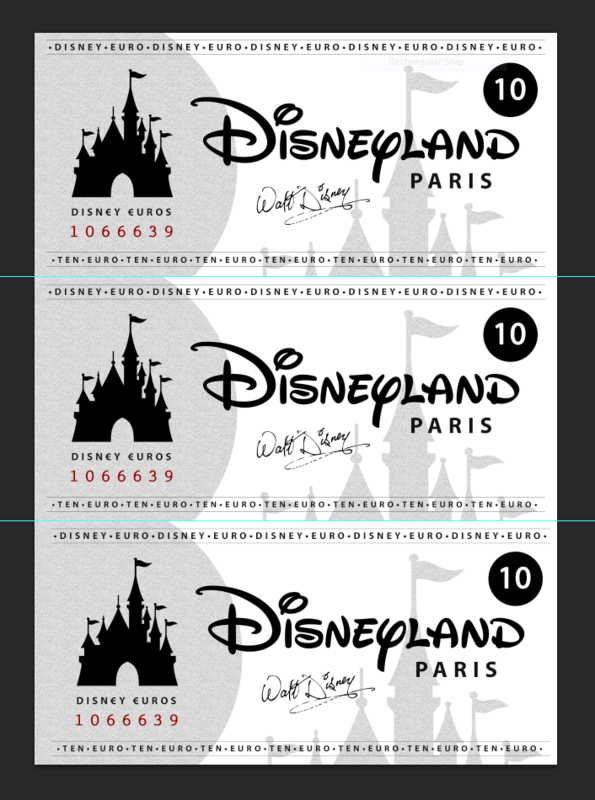 This simple design was created using Photoshop, using elements from Disneyland to represent tickets and spending money for Disneyland Paris. A simple Google image search returned the Disneyland logo and the Walt Disney signature that were used, everything else was improvised. The image shown here displays only the prototype money, the tickets given away had the names of the recipients printed on them and the currency was correctly updated to the Euro. The Disneyland logo is copyright of The Walt Disney Company, and used as an example only for to provide tips of making your own golden tickets.